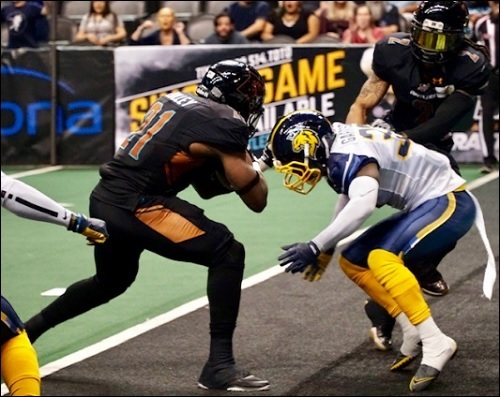 What: Arizona bragging rights are up for grabs as the the Sugar Skulls visit the Rattlers. When: Saturday, March 16 at 5:05 p.m. pacific (7:05 p.m. central). 2019 Head to Head: April 14 - Rattlers at Sugar Skulls. May 27 - Rattlers at Sugar Skulls. June 8 - Rattlers at Sugar Skulls. Note: These teams are separated by roughly an hour-and-45-minute drive. The Sugar Skulls are 2-0 overall and 1-0 on the road. They are coming off a 62-42 home win over the Bismarck Bucks on March 10. The Rattlers are 2-0 overall and 1-0 at home. They are coming off a 81-37 home win over the Cedar Rapids River Kings on March 3. Sugar Skulls RB Shadrach Thornton. With two teams coming into this game at 2-0 apiece, it may not be a stretch to call this the Desert Bowl Series (Battle for Arizona just does not have the same type of ring). Given their proximity to one another, the league has graced fans with four contests between the teams. The fact both teams are located within the same state is only the first of the similarities between the two. 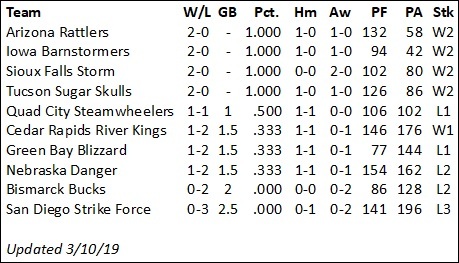 These two teams are the second of a pair of IFL teams which are located in the same state (the Iowa Barnstormers and Cedar Rapids Titans being the other). Of course, there is the coach/ownership dynamic. Kevin Guy, head coach of the Rattlers, and his wife Kathy are the majority owners of the Sugar Skulls. It's an interesting dynamic as the Guys were at Tucson's season opener schmoozing with advertisers and other Sugar Skulls partners. On the coach's side, Kevin Guy said during the game broadcast that he would be looking at film to decipher how to work his Rattlers' game plan in this game. 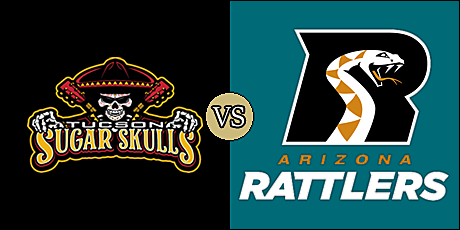 This is the first meeting of four this season between the teams, taking the Sugar Skulls into the "Snake Pit" of Talking Stick Resort Arena. The Sugar Skulls are laced with talent. That can be seen no more significantly than at the quarterback position. 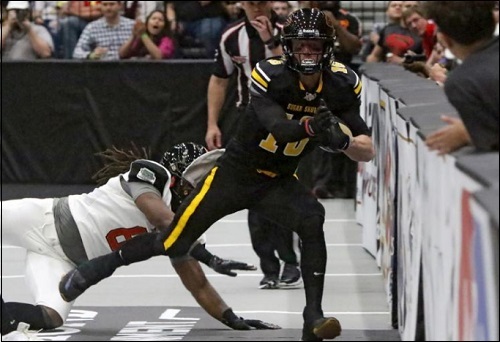 Jake Medlock led the IFL in passing last season, but it's been former Green Bay signal caller Matt Behrendt who has been featured more heavily. Behrendt has started both games, completing 74.2 percent of his passes for a 150.5 yards per game average. He tossed an IFL season-high eight touchdown passes last week in win over the Bucks. Medlock completed 10 of 14 passes for 142 yards and four touchdowns in three quarters in the opener. Neither has thrown an interception. Former Rattler Shadrach Thornton made his Tucson debut last witth with 82 yards off 16 carries and a touchdown. Brandon Sampson has 11 catches for 143 yards and two scores, and Donovan Rasberry has 10 receptions for 104 yards and three touchdowns, and Shaquan Curenton has five touchdown grabs to his credit. Linebacker Zachary Allen comes in with 21 total tackles and a sack.Keith Jones, Jr. has also recorded a sack, as well as a fumble recovery. Diego Marquez has nailed 17 of 18 extra point attempts. Like the Sugar Skulls, the Rattlers possess a solid one-two option at quarterback. Verlon Reed, Jr. and Jeff Ziemba have won the IFL Offensive Player of the Year award the past two seasons (2017 and 2018, respectively). Reed comes in with an 83.3 completion percentage for 171 yards, while Ziemba has completed 75 percent of his passes for 172 yards. Each has tossed three touchdown passes and an interception. Coach Guy will likely use a combination of the two in this game, as he has in the first two Rattlers games. Jabre Lolley leads the IFL in rushing with 87.5 rushing yards per game with seven trips to the end zone. He also has caught three touchdown passes. Veteran Anthony Amos leads the team with seven receptions for 125 yards and two scores. Dezon Epps, who has returned a kickoff for a touchdown, has four receptions for 85 yards and a touchdown. Davontae Merriweather and Ricky Wyatt, Jr. have 16 and 15 total tackles, respectively. Joshua Gordon has a league-leading five sacks through two games. Jimmy Camacho has hit 16 of 18 point after tries, but has not attempted a field goal. The Sugar Skulls have the ball first. Matt Behrendt at QB. No score midway through the opening quarter in this one. Touchdown Sugar Skulls. Mike Jones 2 yard run. Diego Marquez kick. Touchdown Rattlers. Dezmon Epps 26 yard pass from Verlon Reed. Jimmy Camacho kick. Touchdown Rattlers. Dillon Winfrey blocked kick recovery. Jimmy Camacho kick. Touchdown Rattlers. Verlon Reed 3 yard run. Jimmy Camacho kick. Touchdown Sugar Skulls. Matt Behrendt 16 yard run. Diego Marquez kick. Touchdown Rattlers. Markis Sumpter 13 yard pass from Verlon Reed. Jimmy Camacho kick. Touchdown Rattlers. Jabre Lolley 26 yard pass from Verlon Reed. Jimmy Camacho kick. Touchdown Rattlers. Jeff Ziemba 7 yard run. Jimmy Camacho kick.